You can probably remember the times in college when you used to live with your three friends in a tiny apartment. You played garbage can Tetris and conducted scientific experiments in the fridge. Aaaah, the smell and look of a cabbage that’s turned into a literal bag of mush. There was literally no personal space or any other kind space for that matter. Maybe you even had to share the room with someone. There were times when you wished you hadn’t seen something. There were times when you wished you didn’t have to check under the couch cushions every time you were looking for the remote. There was definitely no shopping list on a blackboard in the kitchen. Maybe you had a to-do list but someone probably had already drawn something indecent on it. Your resources were anything that your mom packed with when you went to visit. Your tasks were to study and maybe draw something indecent on your roommate’s to-do list. Your projects were the parties on the weekends or *cough* more like on Wednesdays *cough*. The simpler times. But it isn’t too shabby now either, is it? You, having the time of your life. Reading a resource planning blog. Impatiently waiting for me to get to the point. As you wish. My point is that you need your plans to be clear, don’t you? You are done experimenting in the kitchen. You need space. You need data to be in the broad daylight. Whether it’s information about your resources or maybe you are one of those that like your Gantt charts to be a bit bigger. Either way, we got you. The lists. We didn't add them just for fun. Like we said, there are many updates to come where we are going to add a ton of new stuff that's going to up your planning game. The first of which is going to be that fact that you can edit your resources in the resource list. What does it mean? Well, if you click on a resource name in the list, a resource dialog will open. As you can see, we are moving towards a day where you can do all your resource-related actions in that very same list. You can select multiple resources to archive or delete them. Soon, there will be even more options. Just stay tuned! Next, we are going to teach you a magic trick that you can totally use later to impress your college buddies. Start by saying ‘Abracadabra’. Go to the general settings. Select “CHART”. Make some magical moves with your hands. You know very well what I mean by that. Make your way to a resource or project view. And there you have it! 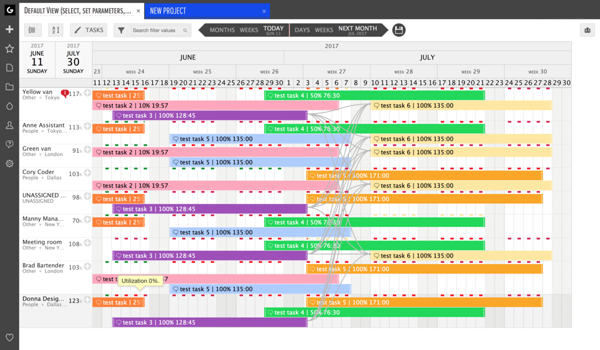 Wider Gantt charts. Everyone will be amazed. Honestly. I wouldn’t lie to you. We talked about having stuff in the daylight. Add we talked about editing resources in the resource list. And one of the new things that you can add from that very resource dialog in the resource list is a custom data field? Well, you can now make resources' custom data fields visible in the resource list in the Gantt chart area. Actually, you can also make an exciting data field visible there if you click on the pencil icon to edit the data field and then mark checkbox before “Show value in chart”. You can add as many data fields there as you wish. Your only limit is the sky. In all seriousness, the sky has nothing to do with your limits. In a way, it’s like garbage Tetris. Your limit is the room you have there. If the default width of the resource list is not enough for you, you can actually drag it quite a bit wider if you hover the arrow on the resource list line. That’s actually not a new feature, we have just been hiding it from you. Think of it as a practical joke? Hehe? No? Okay. So. New magic tricks. A resource list with extra powers. 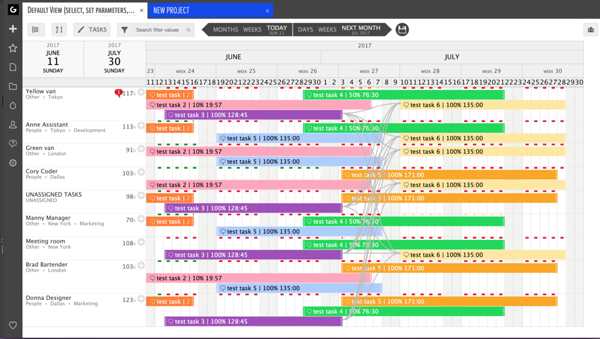 Wider Gantt charts. 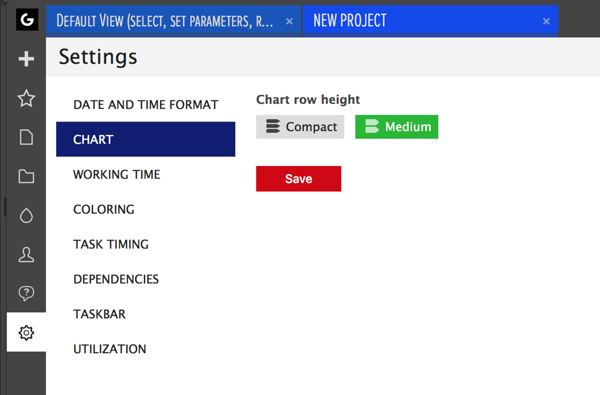 Resources’ custom data fields in the Gantt chart area. What are your thoughts?